"Promote packages, not just a tag, branch/stream or binary"
"…the binaries you release should be the same binaries that have been through the rest of your deployment pipeline, so you can be sure that what you release is what you tested. Apart from the fact that nobody has tested the binaries that came from the release stream, there is also a chance that differences could be introduced in the build process, perhaps by the operations team using a different minor revision of the compiler or a different version of some dependency. Such differences can lead to bugs in production that take days to track down." "One of the objectives of the deployment pipeline is to allow frequent check-ins to mainline on large teams which may result in temporary instabilities, while still allowing you to get rock-solid releases out of the door. In this sense, the deployment pipeline is antithetical to the source promotion model. 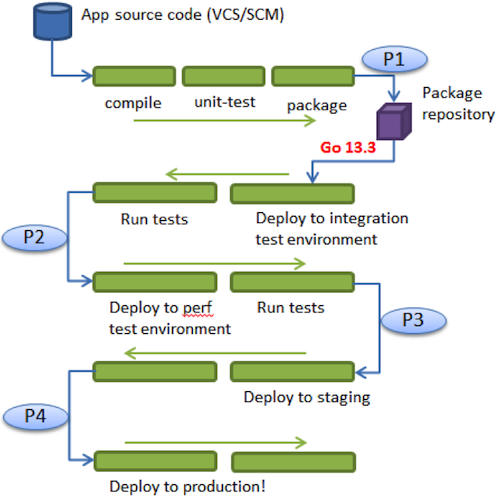 The main advantage of the deployment pipeline lies in the rapid feedback you get on the effect of every change on the fully integrated application—something that is impossible in the source promotion model." "The other essential facility that must be provided by the tool you use to manage your deployment pipeline is the ability, for each stage, to see which builds have passed all the previous stages in the pipeline and are hence ready for the next stage. It should then be possible to choose one of these builds and press a button to have it deployed. This process is known as promotion. Promoting builds at the press of a button is what turns the deployment pipeline into a pull system, giving everybody involved in the delivery process the ability to manage their own work"
In general, a build/deployment pipeline is also a promotion pipeline. GoCD's support for pipelines and stages with automatic or manual approvals makes it easy to model and visualize your promotion process into the CD value stream. A stage runs only when the previous stage has passed - this is like an automatic promotion gate. Manual stage approvals may also be used where needed. Support for package material has been implemented as an extension point. Plugins written to this extension point can provide support for different types of repositories. A yum plugin is bundled along with GoCD Server 13.3. Other non-bundled package material plugins are listed here.